David Malouf is internationally recognised as one of Australia’s finest writers – and a master of many forms, from poetry to plays, and novels to opera libretti. He has won the Commonwealth Writers Prize, the IMPAC Dublin Literary Award and been shortlisted for the Man Booker Prize. He is a magician at conjuring image, at transforming sensation into experience: perhaps this is why he works so superlatively in miniature. His latest book, A First Place, is a collection of essays and personal writing, released to celebrate his 80th birthday. Covering geography, topography, history, multiculturalism, Brisbane and the idea of home, A First Place encapsulates the beauty and contradictions of contemporary Australia. David George Joseph Malouf (born 20 March 1934) is an Australian writer. He was awarded the Neustadt International Prize for Literature in 2000, his 1993 novel Remembering Babylon won the International IMPAC Dublin Literary Award in 1996, he won the inaugural Australia-Asia Literary Award in 2008, and he was shortlisted for the Booker Prize. He is openly gay. David Malouf is currently considered a "single author." If one or more works are by a distinct, homonymous authors, go ahead and split the author. 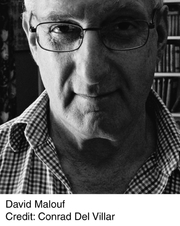 David Malouf is composed of 5 names. You can examine and separate out names.